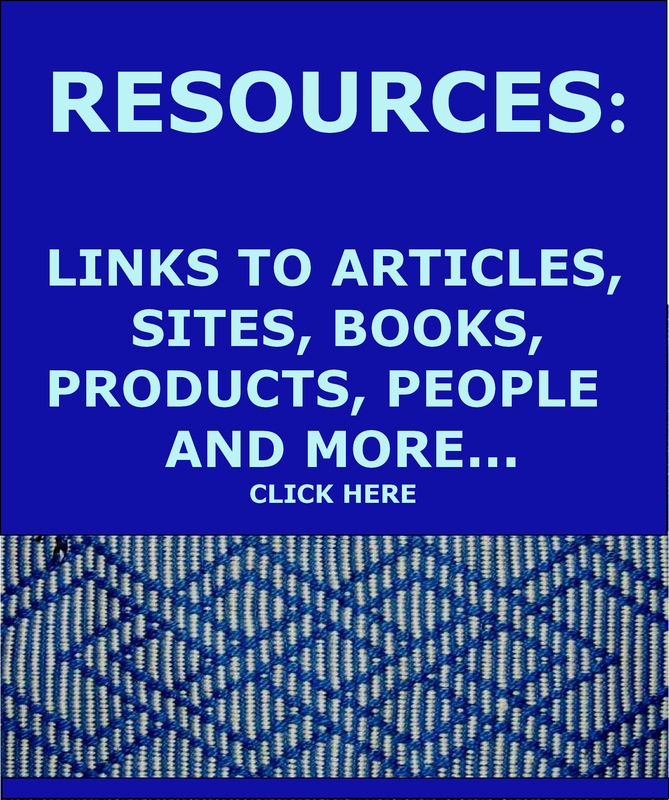 I am taking a step away from the world of the backstrap loom in this post to tell you about my new e-book, Andean Pebble Weave on Inkle Looms. This is a book that I have designed specifically for those who use what I would call a “standard” inkle loom, whether it be a one-of-a-kind home-made model or one of the mass-produced kinds. By “standard” inkle loom, I mean a frame with pegs that has some kind of system that allows adjustments to be made to warp-tension. The threads in half the warp are held in individual string-heddles while the weaver lifts and lowers the threads in the other half to create the two basic sheds. And, I have provided instructions on these looms that are suited to BEGINNER pick-up weavers….those who have found that, although there are unlimited possibilities for weaving beautiful bands in plain weave on inkle looms, they would now like to add some little motifs to their bands….geometric patterns and little animal figures sitting on an attractive “pebbly” background. 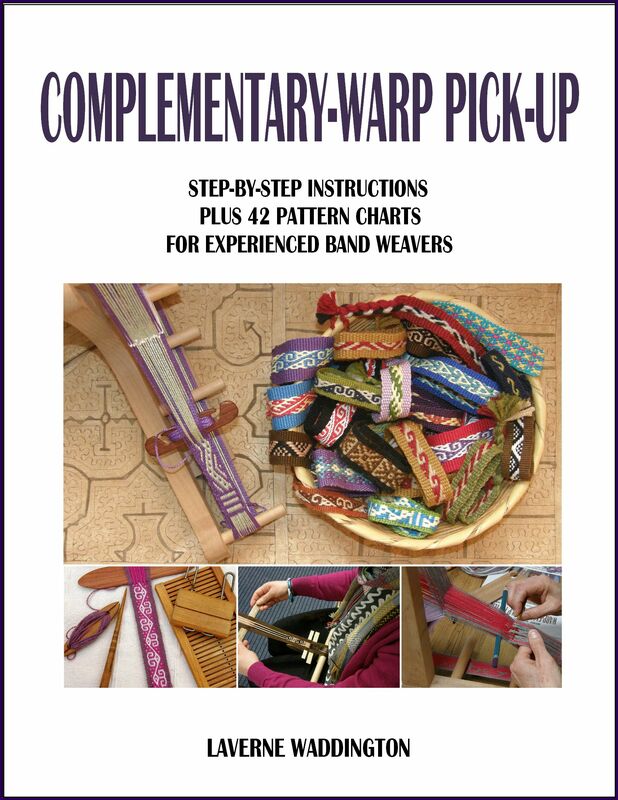 With the experience of warping, setting up the loom and weaving plain-weave bands behind them, they can now venture into the world of pick-up patterns with methods that have been designed specifically for this kind of loom and their level of experience. The methods I present take into account the particular characteristics of the inkle loom. Firstly, I sort out some terminology. 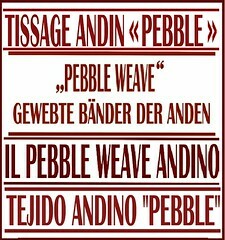 In my wanderings around the internet, I have found that there can sometimes be a little confusion over the terms pick-up, complementary-warp, pebble weave and Andean Pebble Weave. I welcomed the opportunity to talk about those terms in this book. 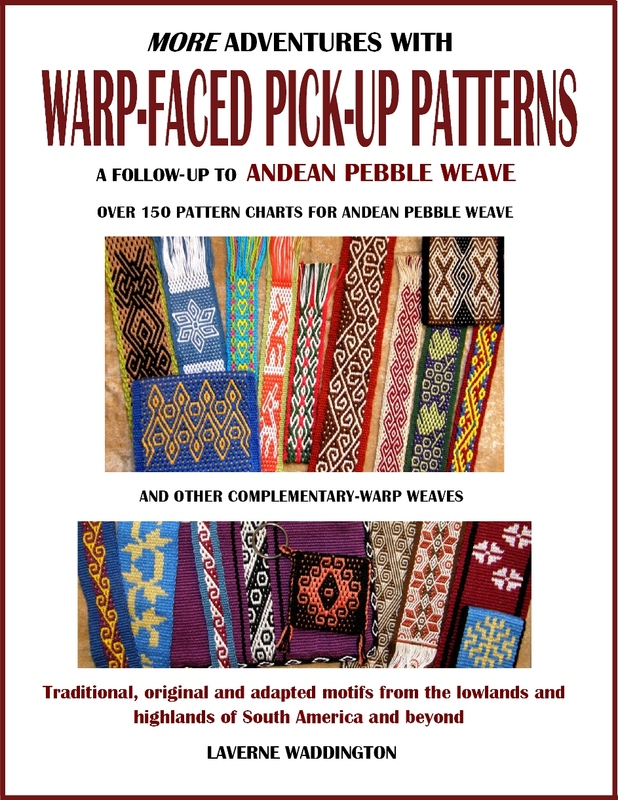 I present three different methods for creating Andean Pebble Weave patterns, two of which are aimed at beginner pick-up weavers. The third method is one that you can try, if you like, when you have gained a little experience and are interested in perhaps adding some short-cuts to speed up the process. You can try just one of the methods or all three of them. All three methods produce the same pretty results! 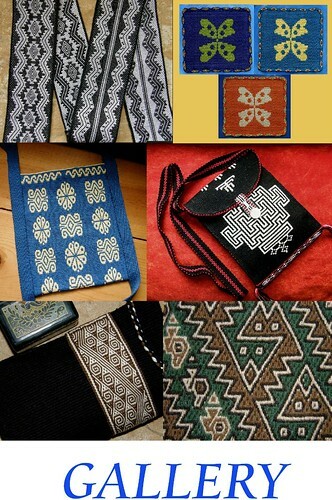 You can decide which one best suits your weaving style. There is a method for those who enjoy getting their fingers in among the threads. The only tools that are required are those that you would normally use to produce plain weave, that is, something with which to beat and carry the weft. Another uses a few additional tools which are as simple as two pencils and a pointed stick! The third requires some additional materials to set-up the warp, no additional tools for weaving, and is for those who are interested in making a little extra effort in the set-up to enable them to see the patterns appearing on their bands faster. Additional string heddles are used in this third method and I cover, in pictures, text and video, the instructions for making them and the tips and tricks for operating them on inkle looms. I use my Ashford Inklette throughout the e-book and in the videos to provide instruction. My friends Ruth Mitchell and Bradie Hansen also contributed with their full-size Ashford and Schacht inkle looms. In order to cater to as many learning styles as possible, I have presented the instruction in various forms. Dozens of step-by-step pictures are used. Detailed text accompanies each and every picture. Instructional video clips take you through the steps all over again and there is an additional set of video clips called “Just Weaving” where you can enjoy watching the flow of each of the three methods, uninterrupted by instruction. The .mp4 video clips can be viewed on all kinds of devices…iPhones, Android devices, iPods, iPads etc…. Tutorials cover how to recognize mistakes and un-weave, finish a band, lay out patterns, weave two different kinds of borders, and manage chart-reading. 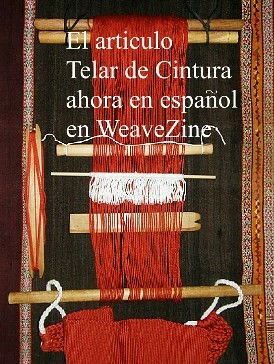 Tips for left-handed weavers are provided. The book finishes with twenty-two Andean Pebble Weave pattern charts for small motifs which are perfectly suited to beginner-level. Plus, there are two surprise bonus charts with patterns I know you will love! If you already own and are using my e-book, Complementary-warp Pick-up, for your inkle loom, you won’t need this new book….unless you are curious about adding a couple of other methods to your pick-up weaving repertoire on inkle looms. The second kind of border structure that I teach in the Appendix of this new book might be new to you too. Which method do I prefer? It very much depends on a number of factors which take into account the kind of material I am using for warp, the weight of the yarn I am using, as well as the number of threads. I love to have different methods up my sleeve to use in all kinds of situations, just as I do for my backstrap loom. If you have seen me or other weavers using additional string heddles to create Andean Pebble Weave patterns on inkle looms and have wondered about those, the third method in this is book will answer all those questions…all the why’s and how’s of making them, as well as using them. ANDEAN PEBBLE WEAVE ON INKLE LOOMS…..! And now I shall return to my pocket-bag fabric which is so very near completion. The second two weaving ladies are now happily seated at their almost-finished looms and I am about to add my newly-created pattern for the tree which will shade them. I suspect there will be some un-weaving for adjustment because I am being naughty and weaving the tree without first sampling! Perhaps there will be a finished bag to show next time I post! I am so glad you wrote this Laverne! I ran over to Pattern Fish and grabbed it off the fiber shelf!!! I cant wait to play with it! Thank You! It may be easier for me to learn pebble weave on an inkle loom, as I can concentrate on the pattern and not the loom so much. I know the patterns will be a bit more elongated. Thank you so much! Two fantastic books in 2019… and it is only February! I am in Colombia now and just downloaded it. Thank you so much! Bonsoir ,je ne comprends pas du tout l’anglais .j’ai donc beaucoup de mal à rentrer en contact avec vous .j’aimerais savoir si vous vendez de la laine et savoir aussi quelle laine il faut employer pour faire ce genre de tissage .j’aime beaucoup ce que vous faites ,c’est magnifique . Il n’y a pas de traduction française ,je suis perdue dans vos explications .je viens souvent consulter votre site et j’espere un jour savoir faire grâce à vous de si belle choses . Est ce que l’on peut espérer un livre en Français ? Having just got a floor inkle loom and being a beginner inkle weaver I have just bought your new book. I am sure it will be useful. Can I say how great that video is of the Chinese backstrap weaver!! She is wonderful!! Which area of China is she from? Sue and I were at Shetland Wool week last September. I did workshops on Peruvian knitting. and I was interviewed for Fruity Knitting, a well known knitting podcast. It is episode 65 if you want to have a look. We have broadened out our Cambridge group from just Peru now to Textile Traditions Study Group, so we can look at other cultures too. We all still remember your visit to Cambridge and Norfolk with affection.